Big, Powerful and CHEAP this Friday! Black Friday is a migical time of year! Every November my wife spends days plotting her strategy out to get the best deals on stuff we need and some we just plain want. It may mean standing in line freezing our butts of and listening to some idiots jabber on about who know what for a couple of hours, but it has become a right of passage for us, and we love the challange. This year there’s a lot of things we would like to get, but i thought I’d pass on this tidbit to my fellow LJ’s. I actually bought one of these two years ago and am glad I did. It’s big (16 gallons), powerful (5 hp), Cheap ($27.49 is 75% off the regular price) and if you add a hepa filter it can be one of the most useful tools in the workshop for keeping things clean and the air fresh. Here’s the thing, it’s going to be on sale at Menards (if you have one near you) and you’d better be there at least an hour before they open to get colse enough to the front of the line and then make a dash right toward wherever in the store it will be because they will go fast. They also have some other deals worth a look if you’re going to be there anyway, like a Performax Oscillating Multi-tool for $30 (that’s $70 off). Maybe you’d rather pay full price and not get in line at 4 in the morning. Me, I like to get a good deal. No Menard’s any where near here and I already have one I bought a few years back. Thanks for the heads up! Thanks for the post. I have never gone out on black Friday but this is a good enough deal to make me think about it. Anyway, thanks for the post on shop vac! Dan- It’s a joke. I guess we dont’ have the same sense of humor. Actually it’s a quote from the popular NBC comedy “the Office”. I’ve never hunted before, and doubt I’d take a shovel into the woods anyway. Maybe I’ll change the line. Oh Jim, please put the other tag line back. I love it. Dan, the joke is if he had a gun to shoot it in the first place, then why use a shovel to finish the job. Just use the gun. Funny stuff in a weird way. Thanks for the tip and the memory spark. 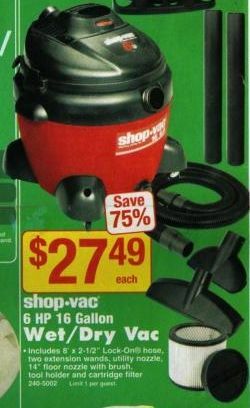 Lowe’s has the equivalent 17 gallon (IIRC) Shop Vac brand for under $30. A great deal. Also a compact DeWalt 18V NiCad drill/driver with 2 batteries, charger and case for $99. David- seems that Menards and Lowes are copying each other- Menards not only has the same Vac deal, they also have the same Dewalt drill deal! Thanks for the tip because not everyone has a Menards near them! The Menards near me was crazy,packed wall to wall. I got there at 6:10 and store opened at 6. Any thing good was sold out already. I don’t think I have the black Friday spirit ! Congrats to those who do though ! HA HA! Wallkicker- This year was pretty bad at Menards. People are starting to catch on about the good deals at the home improvement stores! You MUST be a newbie to the Black Friday scene since you thought you could get there after it opened! Those people ahead of you had been in line since about 3 AM… that’s what it’s all about! You stand in line freezing with some complete strangers drinking coffee and making new friends. You yell at the people who try to cut in line. You try not to get trampled and lose your tenper when the doors open and the frenzy begins! It’s a beautiful thing, my friend! Did anyone get the Shop Vac? I didn’t need it since I have several already, but I stood in line and got some other stuff! Home Depot has a similar Ridgid 5HP, 16 gallon vac on sale for $28.88. We bought two and they work well. One will be installed in a new miter saw station we are building and we are using the other with a couple of PC random orbital sanders for dust control. The vacs also allow you to connect the hose to the outlet which is great for blowing sawdust off benches and such. The hose is a little short for my liking but does clip to the inlet or outlet so you can drag it around by the hose. Think this is a pretty good buy.